Akwaaba DC, a historic bed and breakfast in Washington, D.C.'s Dupont Circle neighborhood. This elegant B&B features rooms that celebrate African-American authors. 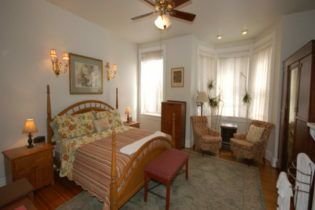 Situated in a prime location for night life and dining options, the B&B is only four blocks to public transportation. The Smithsonian Museums and National Monuments are a quick ride on the Metro or bus systems. 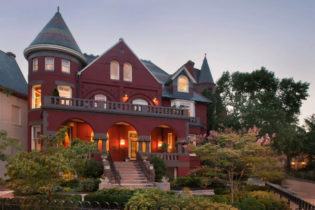 Treat yourself to the romantic splendor of Washington, D.C.’s Akwaaba DC bed and breakfast. 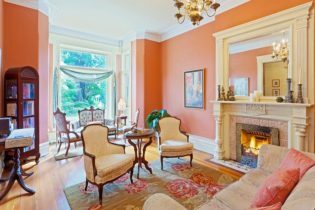 Located in the beautiful neighborhood of Dupont Circle, this historic Victorian townhouse is within easy access to public transportation. The Metro, Washington’s subway is a 4 block walk, Metro, Metro Bus and Circulator Buses. Guests will be within walking distance to numerous restaurants, boutique shopping, renowned book stores and cozy cafes and coffee houses. The Smithsonian Museums and National Monuments are a quick ride on the Metro or bus systems. The elegant Akwaaba DC offers eight uniquely decorated guest rooms dedicated to African-American authors and literary genres. All rooms include a private bath, personal refrigerator, wireless internet, cable TV, luxurious bath robes and Akwaaba branded bath amenities. The Langston Hughes and Zora Neale Hurston rooms feature jetted bathtubs for 2. All guests enjoy a homemade full breakfast each morning, 8am weekdays and 9am weekends and holidays. We also serve light refreshments each afternoon. For our guests who travel to Washington by car, we have reserved off street parking spaces available for $20 per night. Parking is limited, so be sure to reserve early. The Cardozo Guest House is simple and comfortable, in a great location just north of Logan Circle, less than 2 blocks from the U Street/Cardozo Metro station (Green & Yellow lines). We offer 3 rooms on the second floor that share a bath, 1 suite on the third floor with a private bath and Jacuzzi, and a basement apartment with a kitchenette, sofa, and laundry facilities. There is a TV in the common living room, and all rooms have wireless internet access. The Cardozo Guest House provides easy access to a variety of Washington, D.C. attractions, including the Washington Convention Center, Smithsonian Museums, National Mall, and a variety of restaurants, shops, bars, and entertainment venues in the U Street commercial district. This is a self-hosted property – breakfast is not served and unfortunately, due to city regulations, guests cannot cook. Each room (except the Pembroke) has a small refrigerator and coffee maker, and guests can use the microwave in the kitchen. The Chester A. Arthur House Bed and Breakfast provides Victorian splendor alongside modern comfort in the heart of Washington, D.C., right on beautiful Logan Circle. The house was built in 1883 in a grand style, and has been elegantly restored. We offer 4 gorgeous rooms on the second and third floors, all with private baths, cable TV, and wireless internet access. A delicious hot breakfast is served each morning, family style, in the charming dining room. 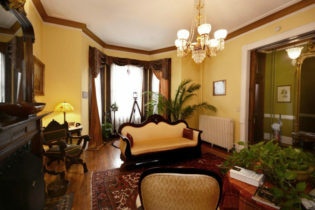 The Chester A. Arthur House Bed and Breakfast is within walking distance of the National Mall, major government buildings (including the White House), world-class museums (including the popular Spy Museum), art galleries, theaters, restaurants, upscale nightclubs, and the new Convention Center. It’s just 5 blocks to the Mt. Vernon Square Metro station (Green/Yellow line), and an easy walk to Dupont Circle. Ours is a great neighborhood for a peaceful stroll, with its many elegant Victorian homes.